The Web has evolved into a huge mine of knowledge carved in different forms, the predominant one still being the free-text document. This motivates the need for Intelligent Web-reading Agents: hypothetically, they would skim through disparate Web sources corpora and generate meaningful structured assertions to fuel Knowledge Bases (KBs). Ultimately, comprehensive KBs, like Wikidata and DBpedia, play a fundamental role to cope with the issue of information overload. 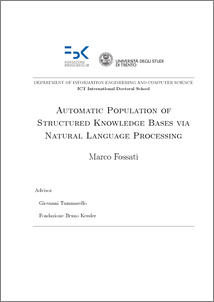 On account of such vision, this thesis depicts a set of systems based on Natural Language Processing (NLP), which take as input unstructured or semi-structured information sources and produce machine-readable statements for a target KB. We implement four main research contributions: (1) a one-step methodology for crowdsourcing the Frame Semantics annotation; (2) a NLP technique implementing the above contribution to perform N-ary Relation Extraction from Wikipedia, thus enriching the target KB with properties; (3) a taxonomy learning strategy to produce an intuitive and exhaustive class hierarchy from the Wikipedia category graph, thus augmenting the target KB with classes; (4) a recommender system that leverages a KB network to yield atypical suggestions with detailed explanations, serving as a proof of work for real-world end users. The outcomes are incorporated into the Italian DBpedia chapter, can be queried through its public endpoint, and/or downloaded as standalone data dumps.